The aims of this project are: to present a clearer picture of the experiences of low income renters residing in marginal housing; to understand the weaknesses and strengths of legislation and regulations in different states, territories and local government areas; and to establish a typology of marginal renters that has utility for policy-makers. What constitutes marginal rental housing is subject to competing definitions, but for the purposes of this project marginal rental housing encompasses buildings such as motels, boarding rooms and hostels and also caravan parks that cater for long-term residents. While the quality of marginal rental housing is variable from satisfactory to very poor, this project focuses specifically on the poor end of this continuum, which is usually occupied by low-income households. The renters who reside in boarding houses, hostels and caravan parks include not only vulnerable people on limited incomes, but also students and seasonal workers and retirees. 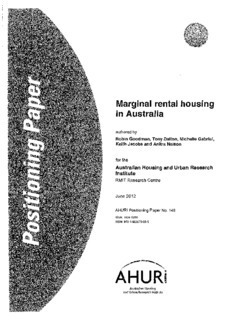 In this Positioning Paper, we: review recent research on marginal renting in the Australian and international contexts; summarise the issues associated with definition and measurement; and examine the Australian state and territory legislation and policy context.